If you had told me a year ago that I would soon have my own food blog I wouldn't have believed you for one single second. If you told me six months ago that I would be taking part in the Daring Bakers' challenges I would have laughed in your face. 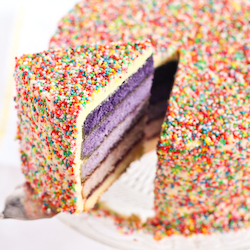 I could barely bake a plain yellow cake back then, and I used to read all the Daring Bakers' posts in complete awe of all the amazing creations that these talented bakers came up with. But the last few months (thanks to some healthy nagging from Lisa and Karen) I've been working up the courage to join and now I'm so glad that I finally did. I was simultaneously thrilled and freaked out after finding out we would be making puff pastry from scratch for my first ever challenge. 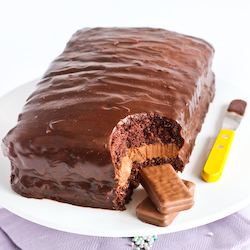 It's always something I've wanted to try making but the fairly long instructions and all that rolling and turning was slightly intimidating for a messy baker like myself who has had some disasters with pastry in the past. But the great instructions and Steph's extra tips, plus this wonderful online video of Julia Child and Michel Richard making the puff pastry, were incredibly useful and made the whole process a lot less scary. Besides the need for patience while chilling the dough, I found the recipe very straightfoward and the dough was wonderfully easy to work with. In fact, at one point as I was making a turn and was having so much fun that I started giggling deliriously and yelling "I love baking!". My boyfriend backed out of the kitchen slowly with a nervous look in his eye. At first I was planning to do a savoury vols-au-vent but then I realised that pineapples were coming back into season here. 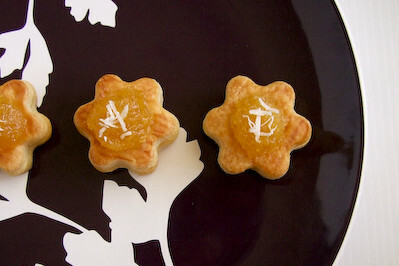 I've been wanting to make Malaysian pineapple tarts for the longest time, and I thought the sticky, fragrant pineapple jam (stewed with cinnamon and star anise) would be a lovely match for these light, buttery puff pastry cases. For a twist, and to balance out the intense sweetness of the jam, I first filled them with a bit of pastry cream flavoured with coconut milk and then topped it off with the jam. The puff pastry turned out beautifully flaky and layered, though on the edges of my cases the rise was slightly hindered due to the crappy plastic cutters that I used. Even so, the texture and taste were even better than I had hoped, and I think it may be hard for me to ever go back to using frozen puff now! 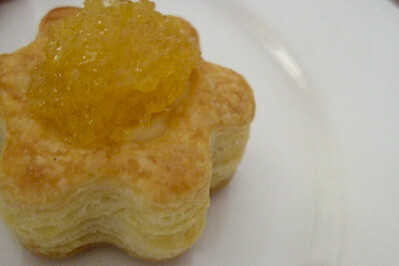 I was also excited to find out my pineapple jam recipe tasted just like how I remembered, and these sweet, bite-sized vol-au-vents are a great little treat for an afternoon tea. 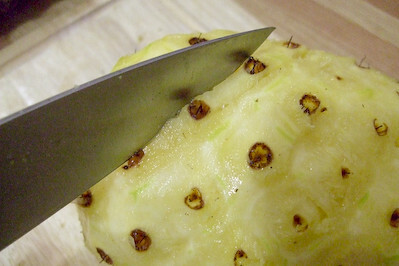 Skin pineapples, cut both ends off and remove the 'eyes' by slicing diagonally underneath them, following each of the spiralling line of eyes from the top to the bottom of the pineapple. This is something I used to find horribly tedious, but gets pretty easy with some practice. (Unfortunately it also means that I'm the one who gets stuck with the job of chopping them up whenever we buy them now.) 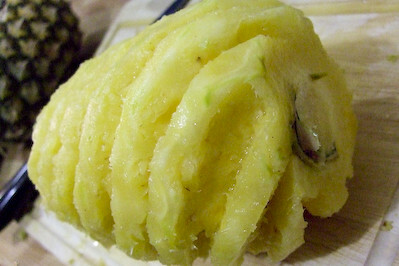 Grate the pineapples in a circular motion, this helps to reduce the fibrous texture. Drain the juice from the grated pulp using a sieve (and save the juice to drink of course!) for 10 minutes. My two pineapples yielded 1 1/2 cups of pulp, if you end up with more or less feel free to vary the amount of sugar in the recipe accordingly. 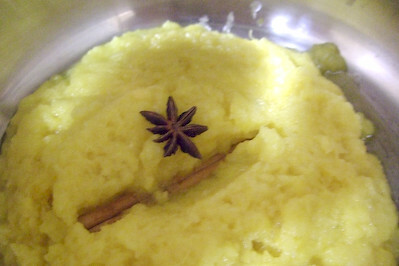 Place pulp, 1 cinnamon stick and 1 star anise in a medium saucepan and boil over medium heat for 30 minutes to reduce the water content, stirring frequently to prevent burning. When the mixture looks dry, add the 300g of sugar, stirring constantly until it is mixed through. Reduce the heat slight and cook slowly, stirring very regularly until the jam is thick in consistency and dark golden in colour. Pour the jam straight into warmed glass jars and cover immediately. 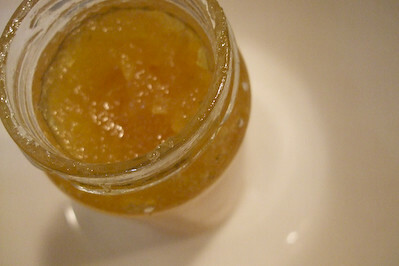 I made this the night before baking my vols-au-vent, but this jam can be stored for months in the fridge. 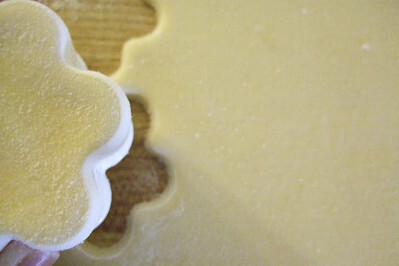 Using a knife or metal bench scraper, divided your chilled puff pastry dough into three equal pieces. 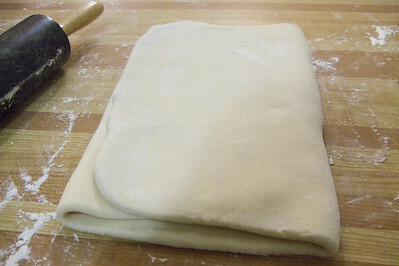 Work with one piece of the dough, and leave the rest wrapped and chilled. Using a ¾-inch cutter for small vols-au-vent, or a 2- to 2.5-inch round cutter for large, cut centers from half of the rounds to make rings. These rings will become the sides of the vols-au-vent, while the solid disks will be the bottoms. You can either save the center cut-outs to bake off as little "caps" for you vols-au-vent, or put them in the scrap pile. 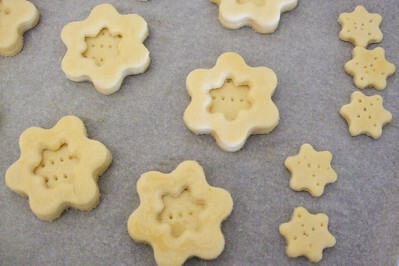 Dock the solid bottom rounds with a fork (prick them lightly, making sure not to go all the way through the pastry) and lightly brush them with egg wash. Place the rings directly on top of the bottom rounds and very lightly press them to adhere. Brush the top rings lightly with egg wash, trying not to drip any down the sides (which may inhibit rise). If you are using the little "caps", dock and egg wash them as well. Remove to a rack to cool. Cool to room temperature. 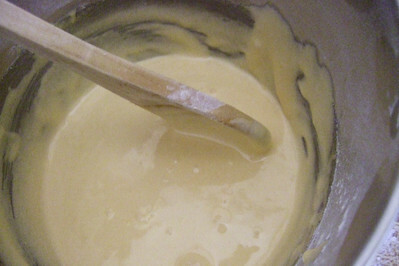 For the pastry cream, combine 1/4 cup sugar and and 3 egg yolks in a medium mixing bowl using a wooden spoon. Gradually add cornflour to the mixture until it forms a smooth, pale paste and then set aside. Heat coconut cream in a small saucepan very gradually on medium-low heat until nearly boiling. 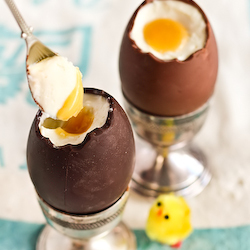 Remove saucepan from the heat and slowly pour into egg/sugar mixture, whisking constantly to prevent it from curdling. Return entire mixture to the saucepan on medium heat and whisk until the mixture becomes very thick and difficult to stir. Take care not to overheat or the coconut milk can split and make the cream very greasy (don't stress if this happens, it's still usable). Remove from heat and allow pastry cream to cool to room temperature, covering the surface with cling film to prevent a skin forming on the top. 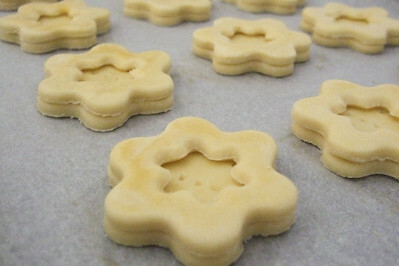 When cooled, pipe pastry cream into vols-au-vent cases and then top each with a teaspoon of pineapple jam. Top with a small pinch of shredded coconut. These vols-au-vents are best served on the same day that you bake them, so if you are not planning to eat them straight away, prepare and assemble the vols-au-vent cases and then store them in the freezer until needed (bake from frozen, egg-washing them first). The pastry cream can be prepared up to 3 days in advance, and as mentioned earlier, the jam can be made months in advance if you wish. I love that 3rd last photo too... it looks like a tree of pineapple stars. This reminds me of CNY's Pineapple Jam Tarts I love so so so much. Congrats with your first DBC!!! Pineapple jam AND coconut pastry cream? Oh...oh my... why does DB have to be so VIRTUAL? My poor tummy doesn't understand! Such great results for your very first challenge! Well done! Woot! These look perfect! Love the star shapes too. Great job. These look beautiful Steph! 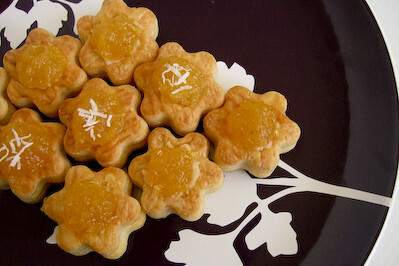 I love the flower pattern and the pinepple jam filling! :) And welcome to Darng Bakers! This is so beautiful and you have presented it well..I so agree with you on the "one year back" thing..i was just a DB lurker but now taking up my third challenge is exhilarating :) My post will be up soon.. This is officially my most fav filling! 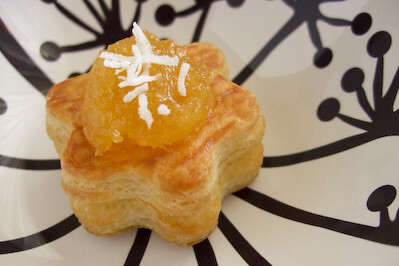 I have such a huge craving for pineapple tarts, ya know! 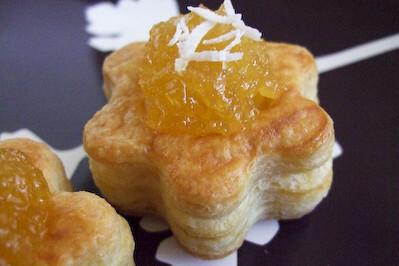 Very cute vol au vents and that pineapple jam sound amazing! Gorgeous, as usual...I could do with one of those about now! Your pastries rose beautifully! The pineapple & coconut combo sounds amazing, yum! Wow your pastry rose so high, love it! Not a huge fan of pineapple, but yours looks so good I might have to give it a go. Wow! Great job on your first challenge. That pineapple is so perfectly cut - very impressive. 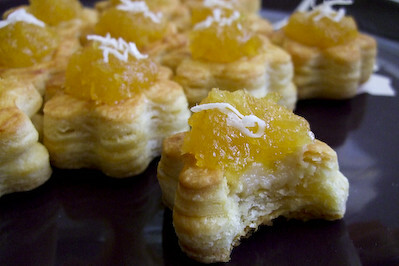 Love pineapple tarts, havent' had them in ages, but now I'm craving them. Those pastries are so cute! And I love the plates! 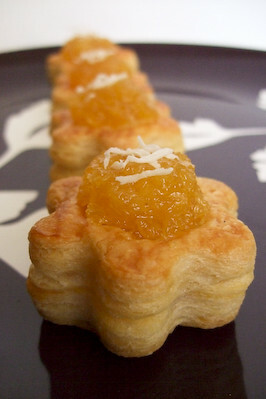 Absolutely gorgeous and what an a great idea of using pineapple .. certainly reminds me of pineapple tarts. Yum! Love the photos!! The flowers are adorable =D. Oh my goodness, these look and sound so fantastic! I love pineapple! Hehe, if you'd told me a year ago that not only would people be reading and commenting on my food blog, but that I'd be so into it that I enrolled in pastry school in the Big Big City, I'd never have believed it. Things can change a LOT in a year. I can't believe I made puff pastry either! Your filling sounds soooo good - way to go! Great job, Steph! 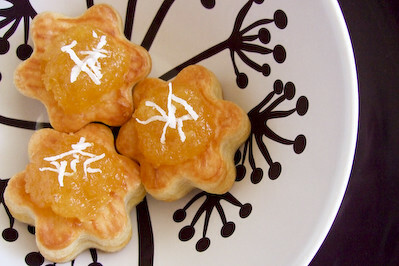 The star-shaped pastry is adorable, and topping it with pineapple jam is a brilliant idea. Eeek puff pastry!! From scratch?! Good on you! 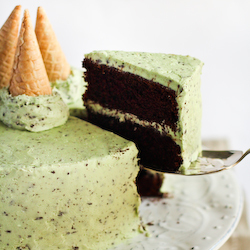 They look sooooooo yummy! Welcome to the DB group! 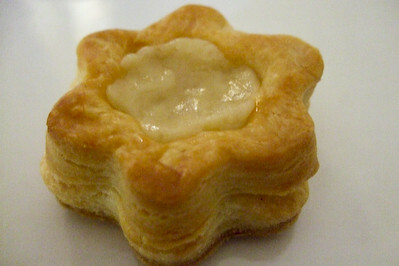 :) Your puff pastry looks so fantastic, and I love love love pineapple jam! *swoon* pineapple and coconut...how delicious! 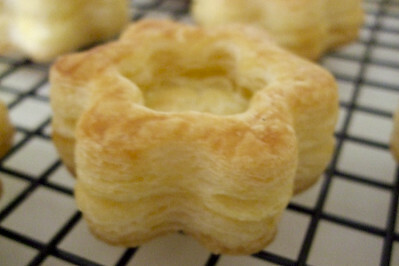 Those are SUCH adorable vol-au-vents (love the shape! ), and the filling sounds so yummy! Ellie - I love them too, I'd been planning to make the proper pineapple tarts but this was a good excuse to test out the jam! Conor - Haha I know what you mean, sometimes i see something so yummy on a food blog and it's just not fair that I can't grab it and eat it right there! Lisa - Thanks so much! kriatv - it's so great once you build up the courage to do it hey? I'm so glad I joined! Thanks so much! Anh - Aww thank you! I've been missing them too :( I need to make more! peasepudding - the pineapple jam is my favourite :) thanks so much! Reemski - Aww thanks hun :) I couldn't stop snacking on them, very bad! Mandy - Thank you! I was so nervous that they would be flat so I was jumping up and down excited when I saw them rising up! s - thanks very much! 6p01053695af5a970b - It's so rewarding isn't it? Thanks so much! Belle - Thank you :) I'm glad i went with it instead of doing my original shepherds pie idea! Brenda - Hehe I know! I would never have dreamed of doing it before this! So worth it though! Y - Thank you!! Same here, I had to force myself not to eat the jam straight out of the jar with a spoon! willowbirdbaking - :) Thank you, you're too sweet! Haha glad to know I'm not the only one scaring my boyfriend with baking delirium! oh they look so cute!! i have been thinking about joining, but i feel quite intimidated. Thanks Betty!! I felt super intimidated, that's why I put off joining for so long, but I'm glad I did! You should join, you'd do great!